In a referendum held on Monday, 64% of the Law students at the University of Chile voted for cutting the university's ties with Israeli universities involved in violating Palestinian human rights. In a referendum held on Monday, 64% of the Law students at the University of Chile voted for cutting the university's ties with Israeli universities involved in violating Palestinian human rights. In addition, 56% of the students voted that activities involving Israeli officials or state funding should not take place at the Law Faculty. 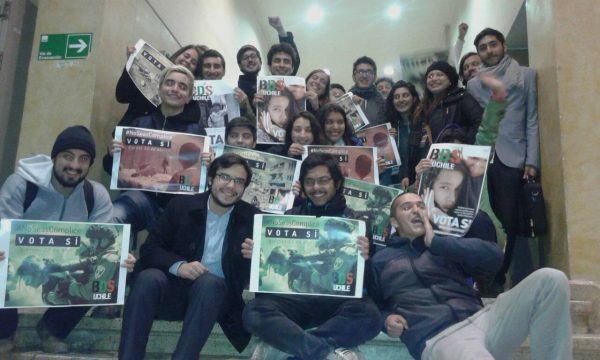 One week after holding a successful Israeli Apartheid Week, BDS UChile - a broad student coalition for BDS at the University of Chile - celebrated the referendum results: “This shows that BDS is right and it has strength, and that our comrades understand perfectly what the Israeli colonization process is and how the Israeli apartheid policies are imposed against the Palestinian people on a daily basis”. Close to one thousand students participated in the referendum, which took place together with the elections for the Law faculty students’ representatives. Since its foundation in 1842, the University of Chile’s Law Faculty has been among the most prestigious institutions in the country and also a stage for many political and social struggles. In 1987, students led a historic general strike and protests against the dean nominated by the Pinochet’s military dictatorship. “This vote strengthens the academic boycott to keep pushing for our home of studies to be free of Israeli apartheid so that we can breathe a clear and democratic air, without segregation, without oppression, without colonization” says BDS UChile. The academic boycott of Israel’s apartheid and colonization regime has been growing in Latin America. Earlier this year, more than 200 Brazilian professors and researchers declared their commitment to BDS. In Argentina, more than 100 professors, hundreds of students and 11 academic institutions have also signed an academic boycott pledge against Israel’s apartheid. In 2012, the University of São Paulo students’ higher representative congress endorsed BDS.